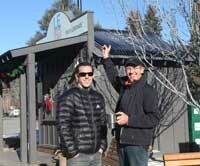 An outdoor ice cream stand operating in mid-winter may seem to be an off-the-wall idea, but that's exactly what the Ketchum Community Development Corp. had in mind when it embarked on Leroy's Solar Thermal Demonstration Project late last year. "The project was seen as both a way to allow Leroy's to open earlier in the summer and remain open longer in the fall, as well as open during special events in the winter," said Jon Duval, executive director of the KCDC, a nonprofit organization formed to deliver projects that improve the quality of life for the Ketchum community. Previously, the cute little ice-cream shack that donates all its profits to local schools (since 2006, more than $47,000 and counting), was just that, an uninsulated shed only able to serve up scoops for schools when the sun shone in the summer. But this is Sun Valley, where the sun shines year-round. So the KCDC decided to harness that fact for the good of the ice-cream-loving community. "This project leverages the resources we have, namely the 'sun' in Sun Valley. It's not an ironic name," Duval said. The idea of opening Leroy's Ice Cream came to local residents Jake and Trina Peters in 2006. A year later they donated the business to the KCDC to allow it to fall under the organization's 501(c)3 status. The KCDC relocated Leroy's from its original home on a grassy lot at the corner of Fourth and Main streets and made it a centerpiece of the new Town Square, which was officially opened in summer of 2010. "The stand was already attracting a large number of customers, both residents and tourists, and having some food and refreshments on the square was always viewed as an important amenity by the square's design committee," Duval said. "So we wanted to be sure and incorporate it when the square was completed. In the past two summers, the profits have soared and it has been nothing but a smashing success." Next came the idea to use the stand as a demonstration project. Leveraging its funding from the city roughly five times, through significant material and service donations, the KCDC was able to insulate Leroy's roof, walls and floor, and install a solar thermal system that provides hot water and radiant floor heating. "Our partners here were critical," Duval said. "Billy Mann at Sagebrush Solar played an integral role in getting the solar thermal panel donated and then spent of lot of his time installing the system. Anderson Insulation donated time and material, Elias Construction provided much of the manpower and Jon Nasvik at Cliff Hangers worked on the concrete at a huge discount." The implementation of the Solar Thermal Project has had three major benefits. "This system saves money on hot water, although not a huge amount is used. But the real benefit is what the system allows. Without it, Leroy's simply could not operate in cold temperatures. In other words, it's not so much about what we are saving, but what the community is gaining." And finally, it operates as a good example to the community. "The other important aspect to this project was its use as a demonstration project," Duval said. "It is highly visible and trafficked, so hopefully it will get people thinking about their own actions and to take responsibility for being as energy-efficient as possible in their homes, businesses and lifestyles." Following the success of the Leroy's solar project the KCDC has plans for some further greening of the city, including installing solar thermal lights as part of the Downtown Walkability Plan. "We are hoping to launch a solar streetlight campaign to have a unique solar-lit downtown," said Duval. To find out more about the KCDC's projects and to submit ideas, visit www.ketchumcdc.org. The Ketchum Community Development Corp. hopes that the greening of Leroy's will inspire others to implement similar measures in their homes and businesses. Habitat magazine wants to hear stories from the community on what people are doing to make their lives green. Go to www.svguide.com/habitat/sustainit to tell the editors what efforts you are making.